Taisetsu, meaning ‘heavy snowfall’. It is named as we start to expect certain amount of snow in Japan from this time of the year. Meaning ‘the QiW, or the air of the sky closes and winter comes’. Interesting point of this phrase is that the KanjiW symbolizing ‘sky’ is not the kanji usually used for ‘sky’ but ‘close’. Moreover, the kanji for the word ‘samuku’ (meaning ‘cold’ from its pronunciation) is not usually read ‘samuku’, though they look alike in kanji figure, is read ‘fusagu’ meaning ‘shut’ or ‘cover’. It sounds difficult and strange to those who are not used to the convenience of kanji but kanji simply are symbols which have many meanings in one single kanji. The useful point of using kanji is that, for example, by using one kanji could draw out readers’ several meanings for understandings. Going back to the kanji of 72 Seasons above, ‘Sora samuku’ for instance, by looking only at the kanji meaning would be ‘closed and shut’ without the word ‘sky’. Now, you will have to be imaginative to understand the real meaning of this whole phrase describing this time of the year…. You continue reading the phrase and come to a kanji ‘fuyu’ which means ‘winter’. This kanji is not ‘trompe l’oeil’ sort of kanji that you faced in the beginning. It simply means ‘winter’! Here, you would imagine that the phrase is expressing something that is ‘closed and shut’ in winter. Practically, the things that are ‘closed and shut’ in winter times are doors and windows but that would be too realistic and has no artistic taste. So, you would have to be more aesthetic on reading such, concluding that what is ‘closed and shut’ in this time of the year is the ‘sky’. Difficult? Yes! It should be. All Japanese studied/studies these in ‘Classical Japanese’ or ‘Modern Japanese’ lessons in school years for at least 3 years though many don’t acquire them…. We still have difficulties! Well then, so this is the time when we start to feel that winter has definitely arrived. Here in Tokyo, we don’t expect snows much but in the countryside, like Yamanashi prefecture for instance, would be expecting snow now. 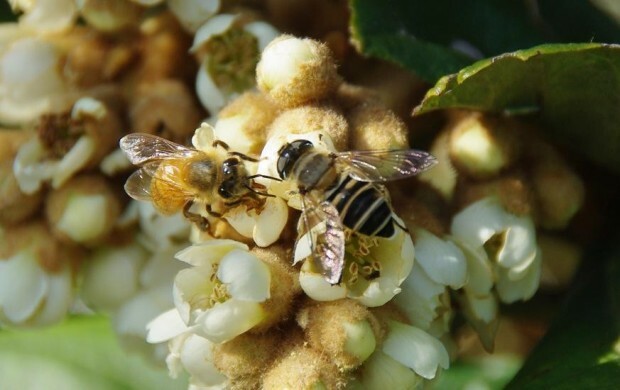 Bees collecting honey from loquat flowers. Photo from ‘Michikusa-no-jikan’, a lovely personal site presenting nice walking in nature. LoquatW flowers are at bloom at this time of the year. 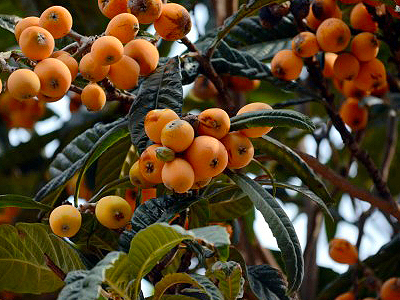 Loquat is a plant that you would see a lot in classical Japanese house gardens which in summer, its fruit is a summer delicacy. There aren’t much plants in bloom at this time of the year, in fact there are only few. 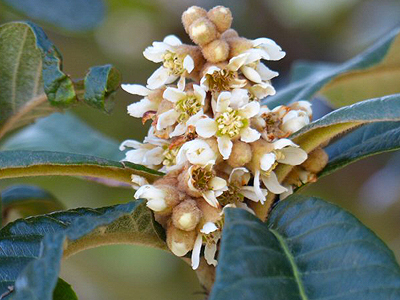 Many insects still surviving swarm to the loquat flowers for the nectar which inspired many poets in the past. If you find the word ‘loquat flower’ in any Haiku or other classical Japanese poetry, the season is now. 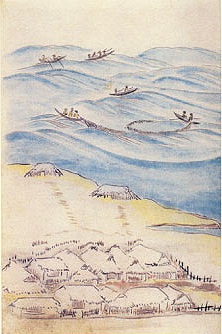 Cod fishing of 18th Century in Fukaura, Aomori. Picture from ‘Hiromaehan Yorozu Sikatsuzukan’. There is a record existing today of the 17th Century that the first caught cod of the year from Sotogahama, AomoriW prefecture was delivered and presented to the ShogunW in EdoW (Tokyo). First cod. Picture from ‘Hiromaehan Yorozu Seikatsuzukan’. In Japan, there is a belief that if you eat something first of the season, your life would extend another 75 days. For this belief, we still have special happy thoughts on food ingredients that come out into the market the first time in the year. Even though the price is high at the start of its appearance in the market, there are still many people today, especially with older people and expensive Japanese restaurants, buying their first ingredients. We give a generic name ‘Hatsumono’ meaning ‘the first thing’ to these certain food ingredients. Cod in this time of the year in Japan is at its first and are about to be one of the best ingredients for your cuisine. Though we personally recommend you later cod than the first as they are pretty expensive…. 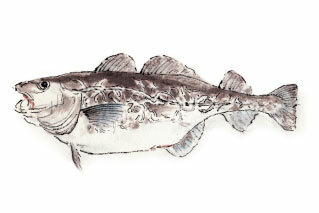 Again, ‘Hatsudara’ meaning the ‘first cod’ appearing in Haiku is pointing out the present season. Tofu with needles. Photo from ‘Ningen kaifuku’. Either 8th December or 8th February is the day of ‘Memorial Service for Old Needles’. Both dates are set for the final day of the ShintoW’s religious services or the first day which were the dates for the farming works’ start or finish. The date differs due to the geographic condition. On the very day of the finish (or the start), farmers cleaned their farming tools and respectfully attended the service held by the local shrine thanking their harvest or prayed and wished their good harvest on the start. This practice interpreted the needlework at home which was thought to be the day to stop (or start) needlework, clean the tools and hold a memorial service for needles that were unable to use because of the damage by have been using them. It may sound strange to you that the Japanese hold religious services not only for creatures but inorganic domestic things. This belief comes from the old Shinto belief of TsukumogamiW, a belief that all things that exist upon this earth have soul, especially with tools and equipments that people have been using on their daily life was said to have souls which would haunt you if you handle them roughly or don’t treat them properly. It sounds unique but the belief was an unfaltering policy in the time when things were precious, unlike nowadays when everything is a throwaway. We ought to be respecting and following our ancestors idea of recycling…. Can you see arms and legs growing from broken and thrown equipments? They are about to head for the revenge… Photo from Kyoto University Library Official Site. 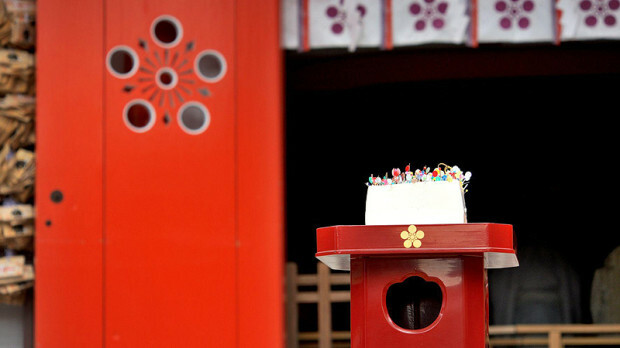 You can see some ‘Harikuyo (Memorial Service for Old Needles)’ at some shrines and temples on the very day of the year. 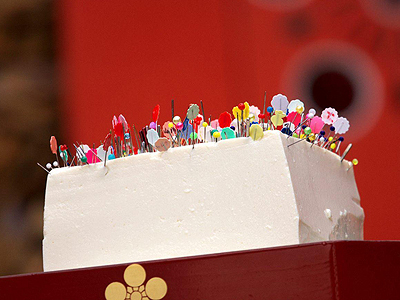 Large TofuW , KonjakW or DaikonW is placed in front of the object of worship where you stick in broken and bent needles thanking for its work and wishing you would make more progress next year. People who have some concern with needlework in their occupation attend a lot in this service nowadays.